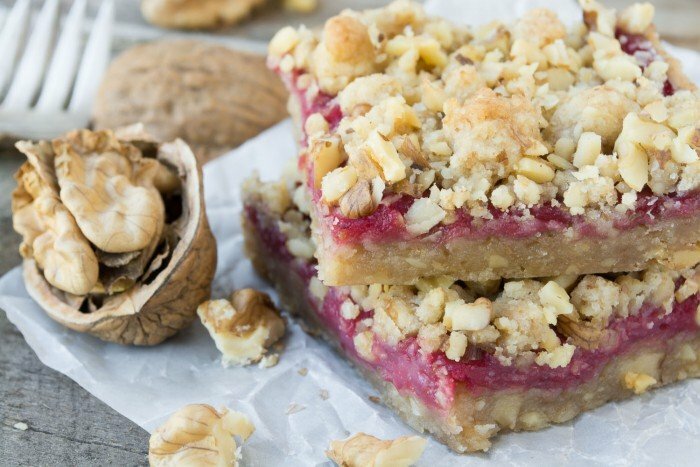 Cranberry Walnut Shortbread Bars are an unbeatable combination of buttery walnut shortbread and tart homemade cranberry curd. 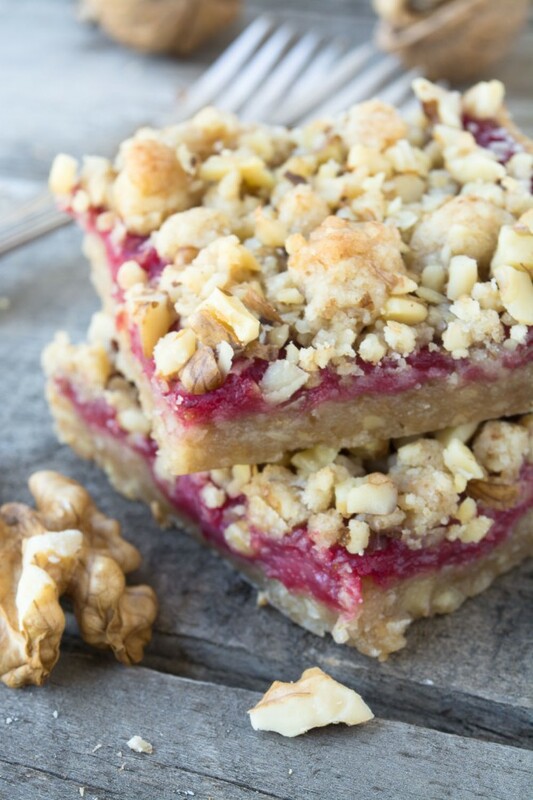 VINTAGE VIEW ~ these buttery Cranberry Walnut Shortbread Bars are from TVFGI archives, first published in 2015. 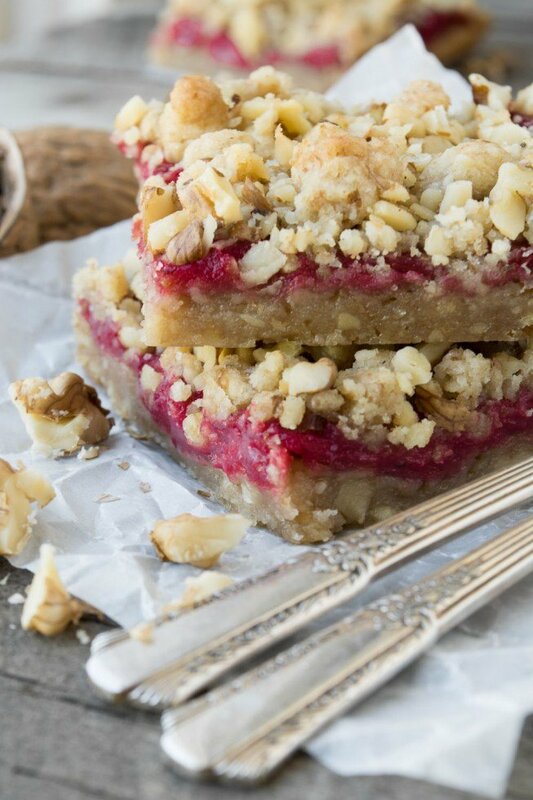 As part of a series on the blog I’m reviving some of the best recipes that you may have missed over the years ~ these crumble bars make the ideal holiday snack, and it’s a super useful recipe to have on hand when you’re asked to ‘bring something’. They’re on my personal list of favorites, so I hope you’ll give them a try. I don’t know what I’m more excited about today, these Cranberry Walnut Shortbread Bars themselves, or the tangy homemade cranberry curd tucked inside. They’re homey and comforting but just different enough to be extra special, I’m really happy with the recipe. The curd filling is bright and tart, the walnut shortbread crust is buttery and soft, and the topping is, well, nutty. It’s so good, this is a must try recipe. The cranberry curd is made with my favorite easy microwave method and it turns out gorgeously thick and glossy. If you love lemon curd and lemon bars, you will love these. Cranberries bring a similar tartness along with their distinctive berry flavor, and nothing can touch that color. Fill your freezer with fresh cranberries while you can! Most curds start with juice, but for this one I used a puree of fresh cranberries for the base. A little sugar and some eggs, then just about 3 minutes of microwaving and voila. You can also do it on the stove top if you like. One standard bag of cranberries will make two batches of this curd, so you can use one for the bars, and save the other for your morning toast and scones. You are going to LICK the bowl clean. The walnut shortbread is no slouch, either. I really loaded it with nuts for an extra ‘walnutty’ flavor. The bottom crust and crumble topping are the same dough, which makes it easy. I showered the whole thing with a layer of more nuts just before baking, which gives every bite a little crunch. Bring the whole batch to a party, or a neighbor…or wrap one or two squares in waxed paper for a long day of work or travel. They’re mainstream enough to please everybody, but just different enough to elicit wows. They are going on my personal list of favorite recipes, I adore them. The walnut shortbread crumble dough is particularly wonderful, so if you don’t have time to make the cranberry curd, you could certainly fill this with something else like store bought lemon curd, or jam, etc. I like to store these at room temperature, under loose foil. Plastic tends to make them soggy. Bars like this are at their very best the same day. I love almost all things cranberry so had to give this a try. 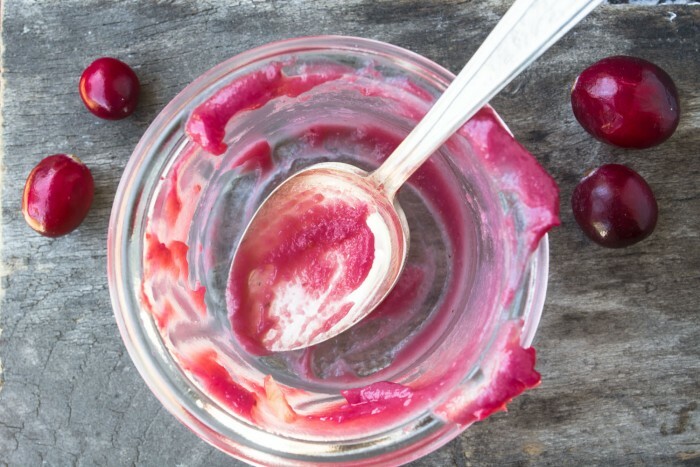 I made the microwave cranberry curd and it is amazing and easy! On to the shortbread—somehow my crust didn’t come across as a coarse crumble texture and I thought I had misread the recipe. I had not so I proceeded with baking the bottom layer. When it came out of the oven, it was so soft I couldn’t imagine being able to spread the cranberry curd. What to do—as I was distracted with a few other tasks the crust was cooling and when I got back to it was a perfect place for the cranberry curd. So I finished up the recipe and while I describe my version as more rustic than yours, the taste was wonderful and a hit with my guests. All this to say I love your site and recipes and my foodie friends at work have been introduced to you and we have all cooked several things. Happy New Year! These look tasty and I will give them a try soon. I just visited you YouTube channel and that looks good, too. I hope you decide to add playlists to it. I’m convinced it will increase viewership as time goes by. I’m further convinced it will be easier to do the sooner you start, rather than later, and I hope you add lists that are more specific than most of your competitors. Combining everything like breads, biscuits, scones etc into one category like “naked goods” will make this site more difficult to use. Oh, I subscribed, and I promise to share your work. Thanks David, I needed the youtube pep talk, it’s on my to do list! I bought 3 large bags of cranberries yesterday from Sam’s for recipes such as these. I LOVE cranberries!!! Can’t wait to try them! I’m with you, wish we could get fresh cranberries year round! I just wanted to say a big thank you for sharing all your great recipes. I live the UK and find the recipes work really well. I’m really thrilled to hear that Anni ~ it’s a challenge to create recipes that span the two cultures and work for both. Indulging! This is a very well worked recipe, Sue, thank you. I do shortbread bars, but I do not bake the crust. The way you do it gives a better whole baked bar. 10+! Thanks Alexandra, this bar is based on one that I revive over and over every time I think of a new flavor profile, it’s so good! Can frozen cranberries be used? Thank you! Yes, that will work fine Dina. Fab, fun, festive and SO delish! These look absolutely perfect for the holidays- cannot wait to try! Sue, how about using Cranberry Butter in place of the curd? Will probably try it before you answer and will let you know how it turns out. These look so good! I love that pop of cranberry color. This is such a creative (not to mention great-looking) recipe, Sue. I love the walnut shortbread itself because for me, the more nuts, the better! The homemade cranberry curd has such a gorgeous color and really makes it pop and so special for the holidays! What a treat. 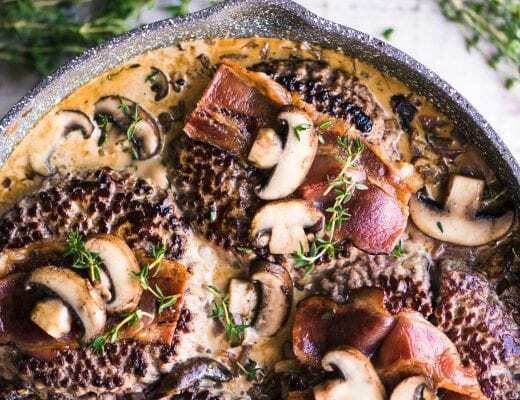 Thanks Monica, I really try to step up ingredients in my recipes so the flavor comes through — that’s what I did here, and it was so worth it, the walnut isn’t just a background note. You’re right about eliciting wows Sue, they look amazing. And so pretty too! mmm…I adore buttery, melt-in-mouth shortbread. These bars look terrific, Sue. I’ve said it before – the way to my heart is a shortbread bar. These are beauties! Sue, this is one of those rare recipes where I wouldn’t change a thing! Lovely! One of these and a strong cup of English breakfast tea would make me very happy indeed. These sound delicious Sue! Just got some cranberries and was trying to decide what to make! Love the shortbread too! Well, I know what my Christmas dessert is going to be! I can’t wait to try these! 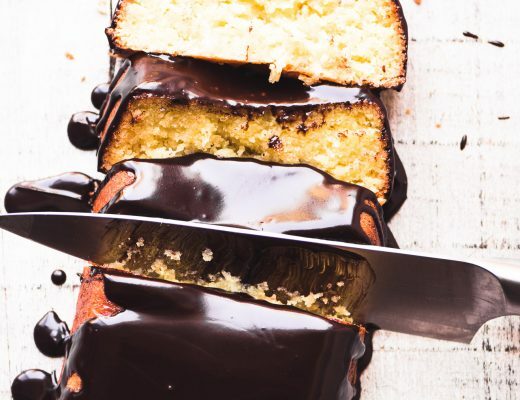 Thanks for sharing the recipe and the beautiful photos. You are amazing! I think these must be the prettiest and most creative shortbread bars I’ve ever seen. 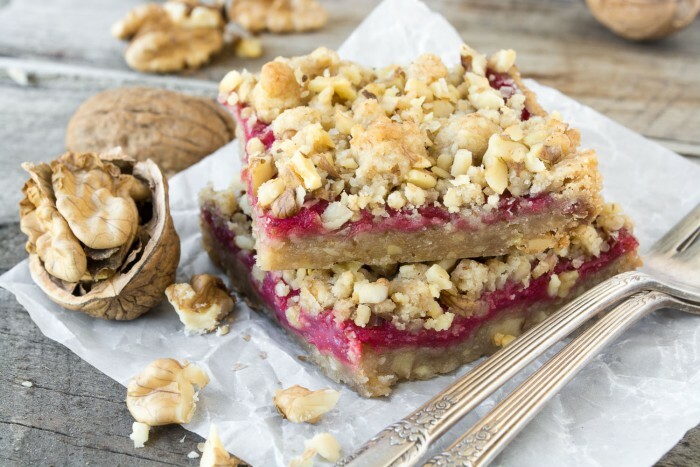 LOVE walnuts and cranberries and shortbread – I am smitten! THIS WAS TOTALLY WORTH THE WAIT! I am soooo doing this, I can hardly stop thinking about it…. 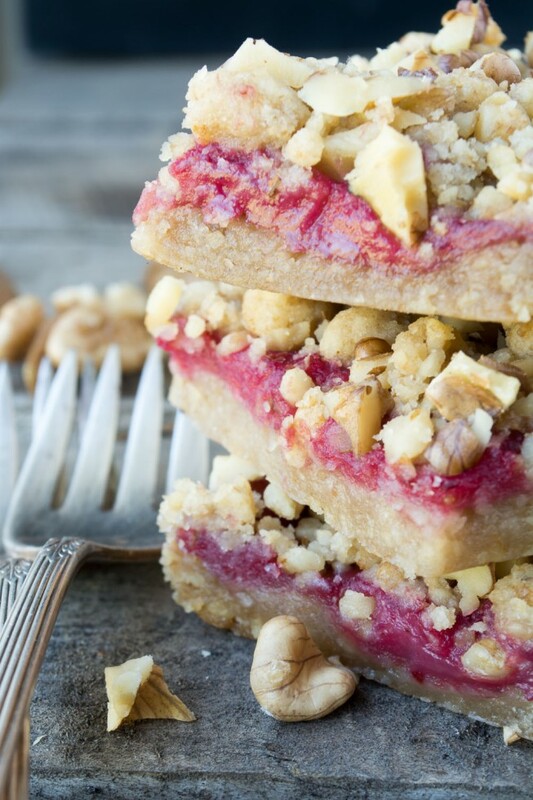 I made a raspberry bar the other day and loved it, but this, with homemade cranberry curd…. no, this is it, my friend. This is it! Sue, I just love your blog and have made many of your recipes over the last year or so since finding it. I’m not a blogger and don’t usually leave comments on the blogs I read, but all these cookies & squares etc… are just sooooo tempting, especially coming into the holiday season. The reason I’m commenting now is – I’m wondering how I could make these recipes “wheat free” as my daughter has an major intolerance to wheat. Any help or guidance would be appreciated. Thanks a million. Thanks for the nice words, Adrienne, I’m glad you finally commented! My oldest daughter recently converted to gluten free eating, and we have had good luck with the shortbreads substituting a good gluten free flour mix. She likes one from Costco, and I have the Bob’s Red Mill blend. The texture is definitely not the same, but in a case like this where there is a relatively small amount of flour, and lots of nuts, it should work. Hope that helps. I can just taste them..your pb choco chip shortbread roll is in the fridge and the espresso one;) Baking today..rainy and gloomy here.. I kind of wish it were a little teeny bit gloomy here…this constant California sunshine makes it hard to get in the holiday mood! Hi Sue, that’s it, I am going out today and loading up on fresh cranberries, this looks fabulous.